Jacobus F. Boers serves as CIBER’s coordinator for instructional technologies. In this capacity, he assists with all types of instructional technology, helps disseminate pedagogical resources for teaching international business through an online portal, and shares his teaching expertise by speaking in workshops, conferences and events. Boers is a professor in GSU’s Institute of International Business with areas of expertise in emerging markets: Eastern Europe, South America, Middle East and Africa; market entry strategies and tactics; and small-/medium-sized enterprises in international business. He brings the practical experience of a successful international business career to the classroom, where he combines the lessons of research, theory and practice. 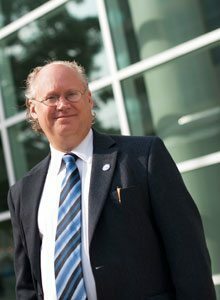 In addition to his teaching, Jacobus is the lead faculty member responsible for the international internship component of GSUâs MIB Program.Â He has directed study abroad programs to South Africa, India and the United Arab Emirates for PMBA students, focusing on the international elements of business while addressing multiple disciplines, including marketing, finance, logistics, business administration and entrepreneurship. Prior to joining GSU in 2007, Jacobus maintained a consulting practice providing management consulting services to a broad range of clients including a number of technology companies on the selection of appropriate international markets for expansion, developing market entry and direct investment plans, and supporting the implementation of plans. He has served as chairman of the Brazilian American Chamber of Commerce in Georgia and the Georgia Council for International Visitors supporting the International Visitor Leadership Program of the U.S. Department of State as well as the Great Decisions discussion program of the Foreign Policy Association. He frequently speaks in public on topics ranging from international career opportunities for young professionals to the role of education in global competitiveness or Africa â a topic close to his heart.